A barrage of criticism was flung at UC Berkeley in late December, but, unlike that of past months, the controversy was not about Occupy Cal demonstrations or tuition hikes. This time, the complaints came from a far more familiar source. After the campus began a maintenance project at People’s Park on Dec. 28, a long history of contention between UC Berkeley and the park returned to the spotlight. The campus said the project’s purpose was to “provide students and the broader community with safer, more sanitary conditions,” in part by reducing the park’s rat population, according to a Dec. 28 campus press release. However, the move drew fierce complaints from park activists. The release said the project — which is ongoing — would not change the overall look of the park, leaving the park’s stage, community gardens and benches intact. But according to Terri Compost, an activist and gardener at the park, the work crews leveled structures that were historically significant for the park community, such as a pergola that volunteers put together after the campus installed a volleyball court in the park in 1991 that resulted in a span of riots and protests led by park activists. Christine Shaff, communications director of the campus Facilities Services Department, said the campus sees the work as maintenance for the sake of safety and improving visibility in the park. The contention surrounding the maintenance project is reflective of a broader conflict over control of the park between the campus and park activists, who believe the park ought to retain the egalitarian reputation it gained during the 1960s. Denney called the campus’s policy toward the park “overkill,” particularly in light of the recent Occupy movement. Still, it is unclear exactly how the campus’s experience with the park has affected its attitude toward Occupy Cal, which was prevented from setting up permanent encampments. The persistent tension could stem from a fundamental difference in the way the campus and park activists view the park’s ownership. “In reality, it’s obviously a public park, and dealing with it as private property is totally inappropriate,” said longtime People’s Park volunteer Arthur Fonseca. Shaff said the construction of the Anna Head residence hall directly across the street contributed to the need for maintenance at the park. But the construction of the new dormitory and plans to renovate buildings on Haste Street for student use have also drawn concern from park occupants who say the new building will mean more police presence in the park, which is currently patrolled by officers from UCPD. Beyond the issue of maintenance itself, according to Fonseca, the sudden arrival of the work crews also upset many park-goers because they did not receive notice from the campus about the project ahead of time. 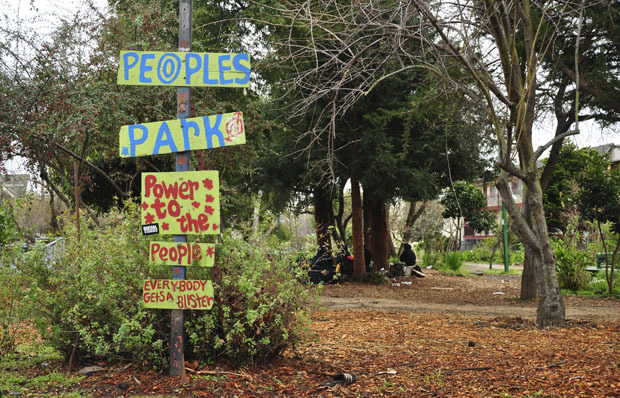 Jim Reagan, a member of the People’s Park Community Advisory Board — which advises UC Berkeley regarding the park’s programs and policies — said there was no notice from the campus about the work prior to the arrival of the work crews. Over the course of the project, a flier from the campus was distributed through the park explaining the project and emphasizing that the overall look of the park would not be changed by the maintenance. “I understand there are people upset, and we’re communicating with them,” Shaff said. Annie Sciacca covers city government.